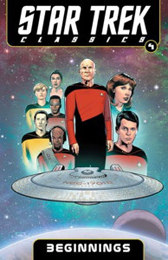 A series of reprints of cassic Star Trek comics. Reprint of the graphic novel first published by Wildstorm in January 2001. 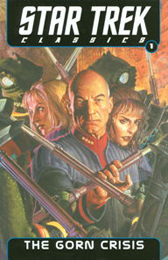 Reprint of the trade paperback first published by Wildstorm in October 2001. Contains the stories Perchance to Dream, Embrace the Wolf, and The Killing Shadows. 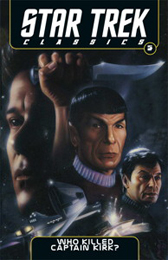 Reprint of the trade paperback first published by Wildstorm in November 2001. Contains the stories, False Colors, Avalon Rising, Elite Force and Planet Killer. 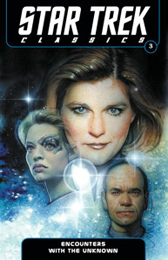 Reprint of the trade paperback first published by DC Comics in May 1995. 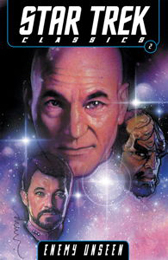 Contains the TNG 6 issue mini-series. Star Trek Classics Vol. 5: Who Killed Captain Kirk? Reprint of a trade paperback first published by DC Comics in June 1993. Contains Star Trek 1st Monthly Series Issues 48-55.